Two convicted killers who were accidentally released from the Apalachicola Correctional Institute through fake documents have been captured by officials. According to The New York Times, Joseph Jenkins and Charles Walker, both 34, were caught Saturday around 6:40 pm at the Coconut Grove Motor Inn in Panama City. When officials found them, according to Reuters, Gerald Bailey, commissioner of the Department of Law Enforcement, said during a news briefing that it was believed that the two men were waiting for a ride to take them out of state. “They had to have had help, and a lot of help, to get to where they were last night,” Bailey added. Joseph Jenkins, who was found guilty of first-degree murder in the 1998 killing and “botched robbery” of Roscoe Pugh from Orlando, was released via fake paperwork on September 27th and registered with the Orange County Jail on September 30th, according to CBS News. It was the victim’s family who found out about Jenkins’ release, and then notified the prosecutors. The prosecutors also found out about Walker’s release, according to Reuters. 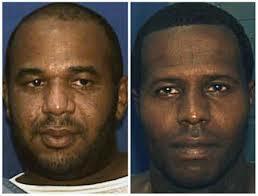 Walker was serving a life without parole sentence for the second-degree killing of Cedric Slater in 1999 in Orlando. He was accidentally released on October 8th and registered with the Orange County Jail three days after, according to The New York Times. The law requires felons to register with county sheriffs, according to The New York Times. Their information is then uploaded to the Florida Department of Law Enforcement, and then a deputy makes sure there are no “outstanding warrants.” Bailey didn’t discuss all details of the fake documents in order to protect the investigation, according to Reuters. He did say, however, that the paperwork looked very real. State Legislators have promised to hold investigative hearings to find out how the men’s fake paperwork, which even included case numbers and a judge’s forged signature, got past the system, according to The New York Times. Chief Circuit Judge Belvin Perry, whose signature was the one that was forged on the documents, said that it’s very easy to get access to his signature, according to CBS News. He added that it’s likely that is signature came from the Casey Anthony trial he presided over. “I think it was lifted off another document and placed on that document, which is not hard to do,” Perry said. He also added that there were a couple of red flags that should’ve caught someone’s attention. One them being that prosecutors rarely ever ask to for sentences to be reduced, according to CBS News. Since the incident, court clerks have been told to talk to judges before accepting any sentence-reduction or release papers that contain a judge’s signature, according to Reuters. Department of Corrections Commissioner Mike Crews said, according to Reuters, that the fact that this happened is embarrassing, but his concentration is “that we come up with a process and procedure that prohibits this happening in the future”.